The National Gallery of Art has acquired the renowned collection of American prints belonging to Reba and Dave Williams and The Print Research Foundation in Stamford, Connecticut, which was established by the couple in 2003. With more than 5,200 works spanning a century from roughly 1875 to 1975 and representing 2,070 artists, the collection is unrivaled in its scope and is among the largest and finest private collections of American prints in the world. The acquisition includes a gift of some 5,000 works, as well as the research library and related assets of The Print Research Foundation. In an independent transaction, the National Gallery of Art purchased 250 works from the Williams' personal collection. "This is a transformational acquisition," said Earl A. Powell III, director, National Gallery of Art. "Reba and Dave Williams' collection has extraordinary quality and breadth and gives the National Gallery of Art an entirely new standing in the field of American prints." Charles W. White's moving We Have Been Believers (1949); Charles Burchfield's haunting Autumn Wind (1952); Lee Krasner's dynamic abstract lithographs; and Jim Dine's outstanding Five Paintbrushes (1973). Of the 2,070 artists represented in the Williams' collection, more than three-quarters of them are new to the National Gallery's holdings. Ranging from the etching revival to Pop art, the collection tells an all-encompassing story and includes major and minor figures alike. For every illustrious print by Thomas Moran, George Bellows, John Marin, and William H. Johnson, there are remarkable examples by George Henry Smillie, William Zorach, Jolán Gross Bettelheim, and Blanche Grambs. 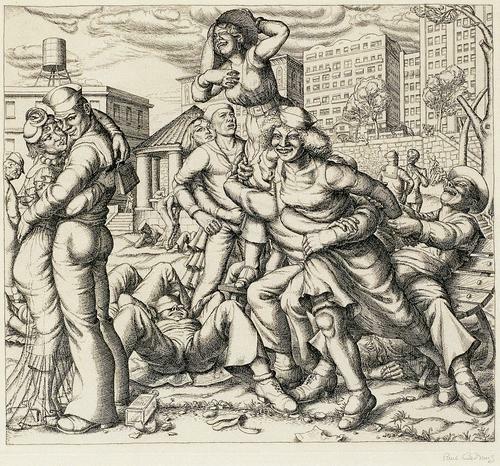 With exceptional strength in the first six decades of the 20th century, the collection includes prints by Ashcan School artists John Sloan and Peggy Bacon; American modernists and precisionists Louis Lozowick, Charles Sheeler, Howard Cook, and Stuart Davis; American scene printmakers Martin Lewis, Armin Landeck, and Reginald Marsh; and regionalists Thomas Hart Benton, Grant Wood, John Steuart Curry, and Wanda Gág. The collection is particularly strong in depression-era and Works Project Administration (WPA) prints, surpassing all others in private hands. It additionally encompasses prints from the 1960s and 1970s, including such significant prints as Ed Ruscha's Standard Station (1966), Andy Warhol's pink Marilyn (1967), and Jasper Johns' screenprint Target (1974). The Williamses also focused on American prints made before the 20th century, and the collection features some 200 works from the 19th century, including Thomas Moran's outstanding Mountain of the Holy Cross (1888), in addition to exquisite etchings by Mary Nimmo Moran, George Loring Brown, Henry Farrer, Fitz Henry Lane, and others.